With more than one hundred dog breeds to choose from, our selection of personalized leather keychains have something for everyone. Choose a loving phrase, like "I Love My Bluetick" across the top and one or two names underneath the picture to personalize your design! In Memory of designs are available, as well. 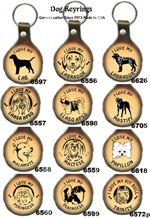 To complement our selection of hand-tooled leather keychains for dog lovers, we also carry cat and horse varieties. These are also available for personalization. Our medium size personalized leather key rings are about 1 3/4" inches across. They are made from 6-oz, top-grain leather and fitted with a durable 1 1/4" split key ring holds for keys. For personalization, we use a dedicated laser engraver (burned in), which comes out dark brown against the lighter brown. The keychain is airbrushed. Our leather keychains do not come in white. Some pictures in our gallery may display them as white. They are crafted all leather. Discounts are available for orders of 50 or more leather key rings. This is perfect for groups, organizations, and promotions. Please contact us for pricing.